What an utter, utter dump. I had to laugh at elsm's review below "I was overcharged, treated like scum and even hit in the face". Welcome to Romford mate! I agree with below. This is by far the best bar in Romford if your on a good night out. People are generally a bit older (20's) and they get a bit more dressed up to go into edwards rather than just yates, custom h or the wetherspoons next door. I've been drinking in romford for years, so can definitely say that the barman/barmaids are so much more friendlier and smilier than the other bars in town. They even drink in the pub themselves on their nights off. On bank holidays or xmas / nye - they usually have a fancy dress which is always funny to see. 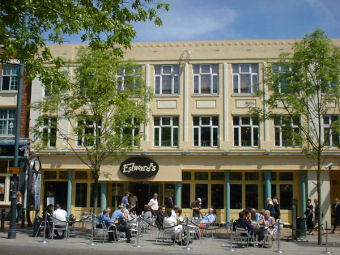 My perfect Sat night out would be dinner in Edwards about 6pm ish, with a few cocktails, and then gets going with with dj about 8pm ish I think. Its cool that there is an upstairs as well, and you can look over to the dancefloor from the balcony. I really like this place, it gets busy on Sat nite, but the staff serve fast and work efficiently. Edwards is a great place to start the night, they don't charge you at the door, and you can have great fun before hitting other late night venues like Opium or Liquid. Dress code might be a little bit strict, but I think they just want to avoid chavs and loud footie fans. Been there during the day, and had some nice meal deals- strongly recommend! Great music on Friday and Sat nite, def go back ;) ooh, and they do " GAY NITE" on Tues, drinks are well cheap, you can a round of 5 drinks for less then a tenner. I dunno what these other comments are about: the doorstaff were really helpful to me last time i was there! I go a lot during the day and at night, and the staff are always friendly to me!